Here's an article about the first Internet cartoon series from 1997. Four months ago we embarked on the task of reinventing the Raketu world. We needed to differentiate the brand and transform it from one that merely offered a great service to one that had a personality. It had to entertain, be engaging and communicate the raft of different services to the very broad 15-75 year old target group. The brand had to be truly global. In the ad agency world where I had spent all my life we always started by defining a brand’s USPS before drafting a strategy/positioning. However, Raketu had multiple usp’s and all appealed to different elements of the target audience. Every member of the family has different communication needs and I had to figure out how to show which aspects of Raketu would appeal to each. My want was to create a Simpsons type cartoon family online, a family that could show off different elements of the brand/product. The brief from my peers was to establish the Raketu family and drive downloads and users ASAP. 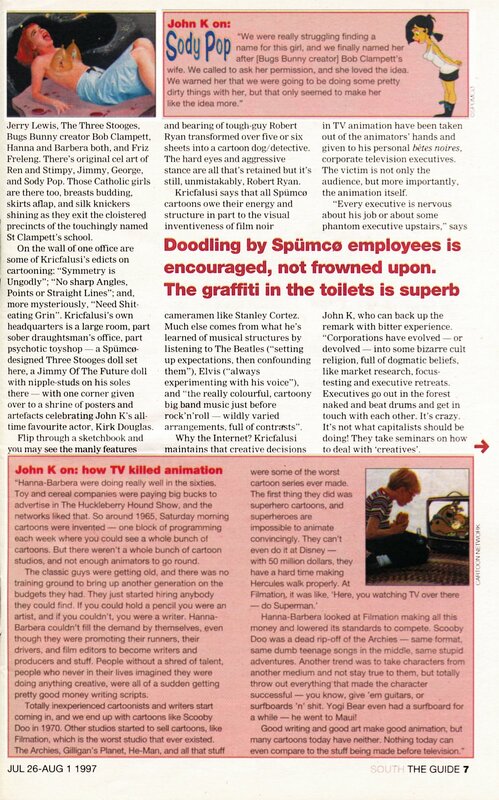 Then in mid November 2006 I talked on the phone to this cool guy called John K. The guy didn’t really say a lot during our initial telephone conversations but he was funny, talented and most importantly, he got it. I knew he was “the one” that would help me to develop the Raketu family. Just before Christmas John came to NYC. Meeting in a café on the corner of 38&8th we started to discuss/develop the family. I didn’t give him a break all day and I remember the guy must have had 20 Diet Cokes throughout the day. John suggested creating a mascot, along the lines of Tony The Tiger for Raketu. He came up with Raketeena the space imp. Raketeena lives in the far future and she visits our time to show today’s primitive humans about how this great brand called Raketu can make their lives better. She would explain to each member of the family in a funny way which aspects of Raketu could work for them. Raketu does so many things that it would take a lot of patience to read through pages of text, so having animated cartoons do the explanations in an entertaining way was the perfect solution for us. Who likes reading manuals? But everyone loves cartoons! The role of the blog campaign was two fold, first to get some brand understanding and awareness here in the US and secondly to test the Raketeena concept. When we first put up the banner, the click through rate went through the roof and so we knew we were on to something hot and we decided to then redesign our website and use John's characters to pitch our products and services. 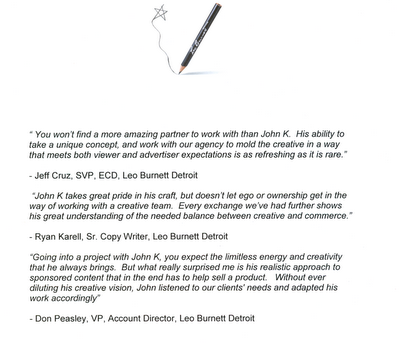 The past two months have been awesome and have had the late night calls, the occasional drama, the constant explanations but I have to say I have really enjoyed working with John and his team. He’s a true pro, and I want to thank him and his team as I think they have done an amazing job. Well I just signed a deal for my pal Steve Williams' commercial house to rep my commercials. Steve is quite well known both as an animator and a director of live action. He was the guy who designed and did the animation for Jurrasic Park. click around the Hoytyboy site and see lots of great commercials by their crew. Thanks Steve, Clint and Emily! 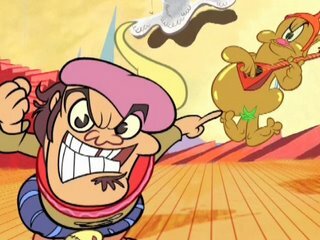 John Kricfalusi is the animated cartoon’s modern pioneer. Kricfalusi started his career during the dark-ages of cartoons. In the 1980’s he worked on such ‘crap’ as he calls it, as The Smurfs, Laverne and Shirley In The Army and other Saturday Morning Cartoons being churned out by the TV animation factories. During this depressing period he and other disgruntled cartoonists developed and pitched his own cartoon creations. His frantic and extremely sweaty pitches terrified network executives. Hired to train layout artists in Taipei, John took a young crew of inbetweeners and tried out a production experiment. 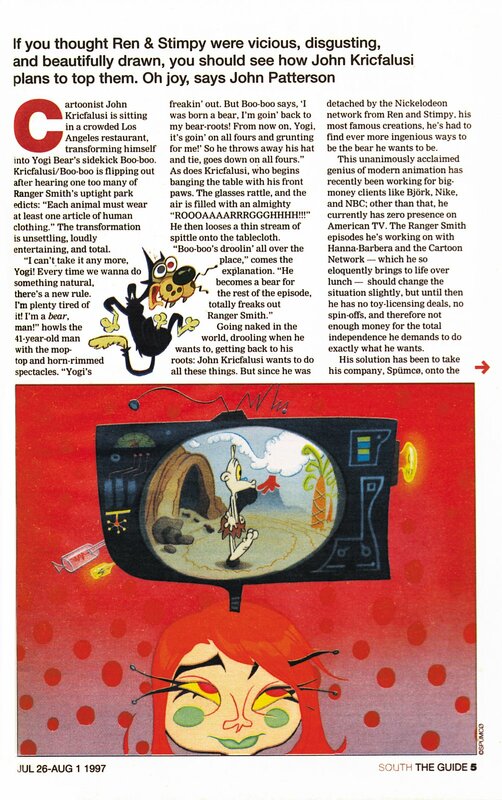 He requested audio tapes of the voice recordings for The Jetsons and played every line for the artists and then customized each pose and expression to match the voice tracks. 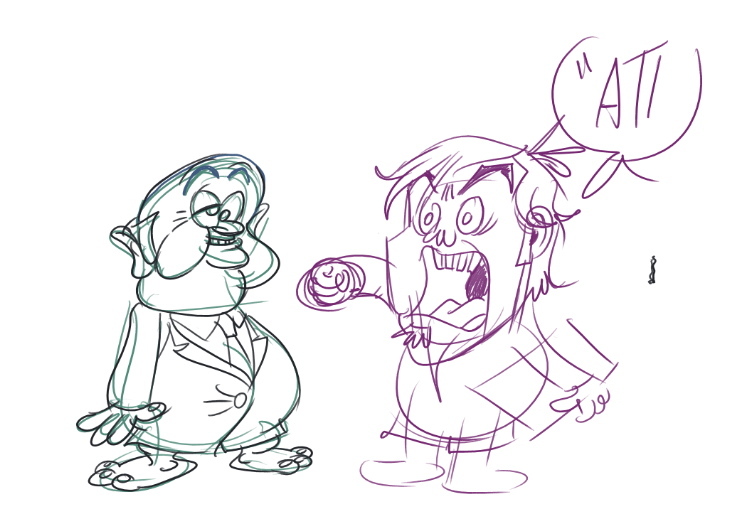 This was the beginning of a new TV animation production system and characters started to show some life again. John also directed his first TV cartoon episode: High Tech Wreck. 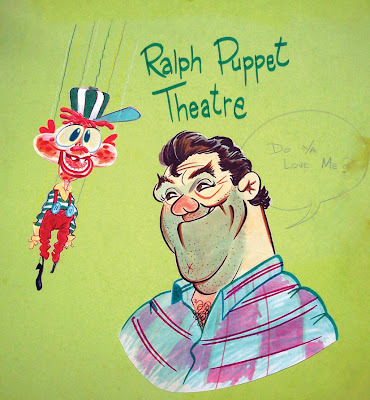 Ralph Bakshi discovered John in 1987 and hired him to direct CBS’ “Bakshi’s Mighty Mouse”. 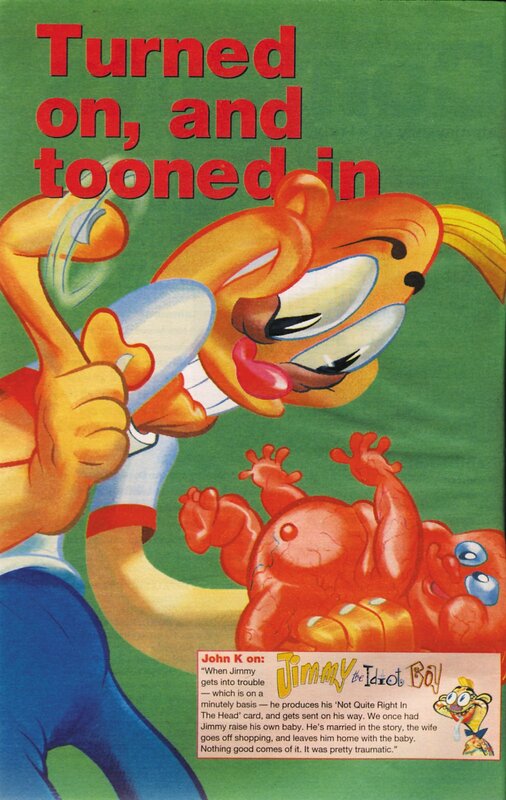 This was the cartoon that started the so-called ‘Creator-Driven’ revolution. 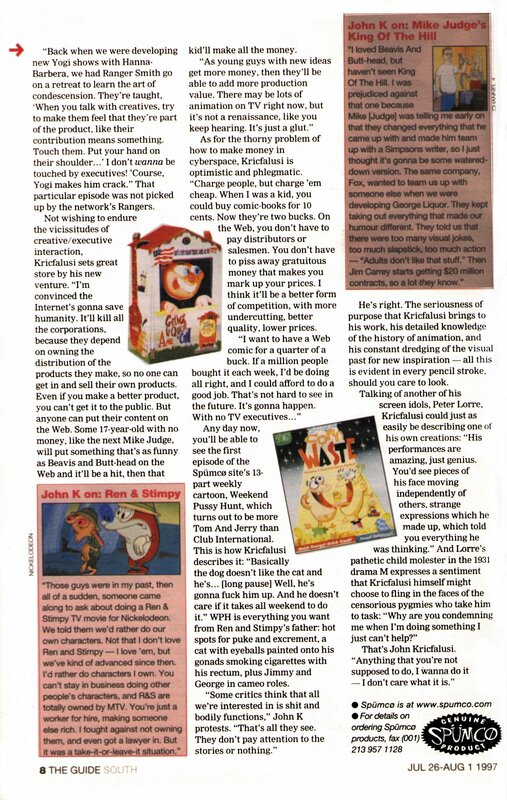 Kricfalusi hired a crew of artists that, like him, were dissatisfied with the formula cartoons they were forced to work on at other studios. They made a witty, satirical and wildly imaginative show for CBS that delighted critics and kids alike and immediately influenced the competing studios. 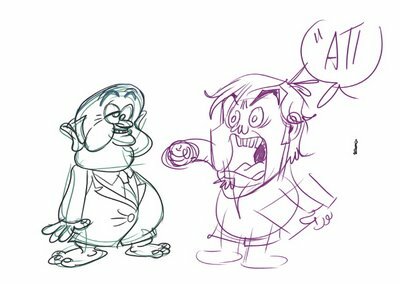 John not only revolutionized the style and content of modern cartoons, he created a new production system that allowed it to happen. 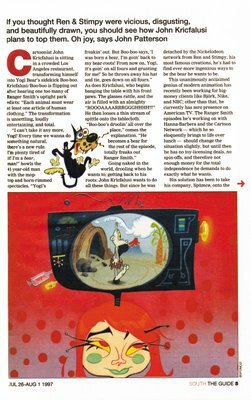 He first introduced the Director-Unit system for Ralph Bakshi’s Mighty Mouse Show, and then went on to refine it for his own Spumco studio and The Ren and Stimpy Show. 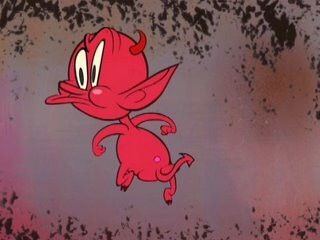 Kricfalusi developed a production system based on the classic cartoon system of the 1940’s but adapted it to the realities of TV production. 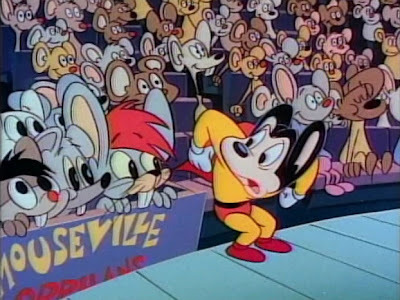 Bakshi’s Mighty Mouse became the foundation of not only the creative revolution that followed, but also gave the industry the mechanism that would allow it to happen. It put the artists back in charge for the first time in 30 years. 2 years later, Ren and Stimpy debuted and the revolution was in full swing. 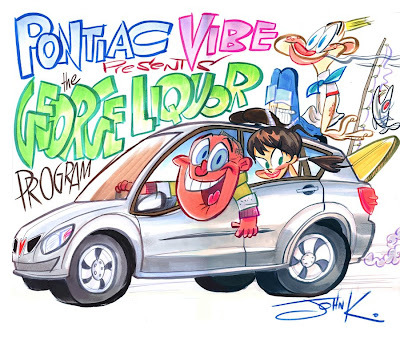 Every major studio today features styles, looks and humor that are highly influenced by John’s cartoons and ideas. 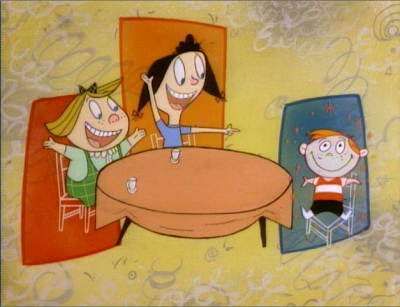 The show also made a fortune for Nickelodeon and enabled them to open their own animation studio. John went on to explain the history of cartoons and pointed out that the classic cartoons, Bugs Bunny, Mickey Mouse and many others began life as short cartoons. 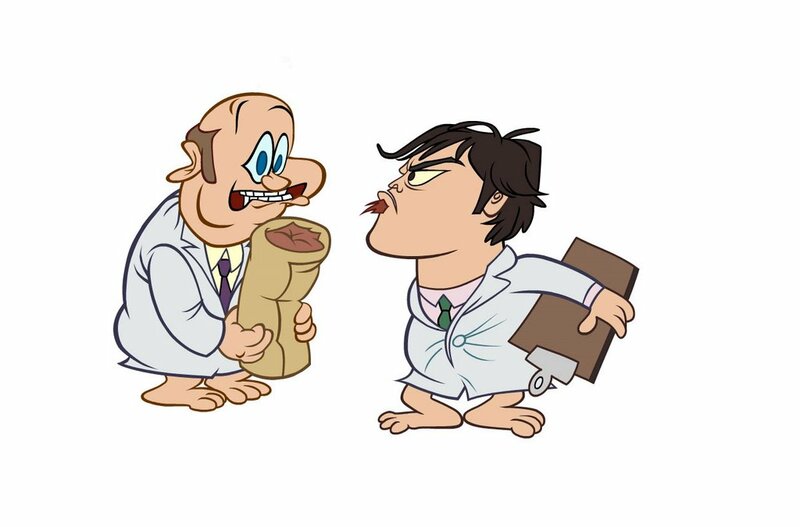 Old cartoon directors constantly experimented with new characters in shorts and when certain characters clicked with the audiences, they would then make many more cartoons with their newfound stars. This led to Dexter’s Laboratory, Cow and Chicken, PowerPuff Girls, Ed Edd and Eddy and many more popular Cartoon Network series. All the other studios quickly followed with their own shorts departments. John started a caricatured revival of classic cartoon characters: Boo Boo Runs Wild, a Day In The Life Of Ranger Smith and other extreme versions of classic Hanna Barbera characters. 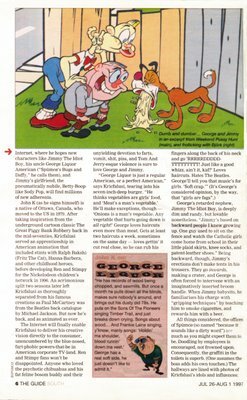 After revolutionizing TV cartoons, Kricfalusi followed up by introducing and popularizing internet cartoons in 1997 with The Goddamn George Liquor Program and developed the techniques for Flash animation that are used at practically every studio today. 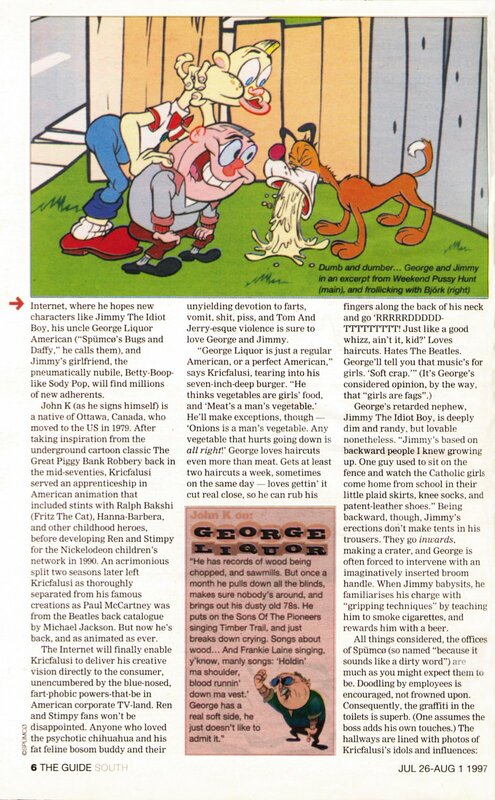 John’s Spumco studio produced a low-budget kid series that has aired for years on Teletoon. It is a very popular show with Canadian kids. 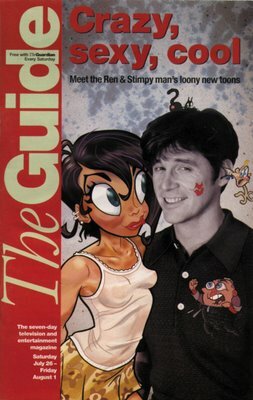 Spike TV contacted John in 2002 and urged him to make an extreme version of Ren and Stimpy. Along the way, John suggested to Spike that they should license the Ultimate Fighting Championship and make a reality show based on the fighters. This became Spike’s most popular show and helped to further popularize the UFC. 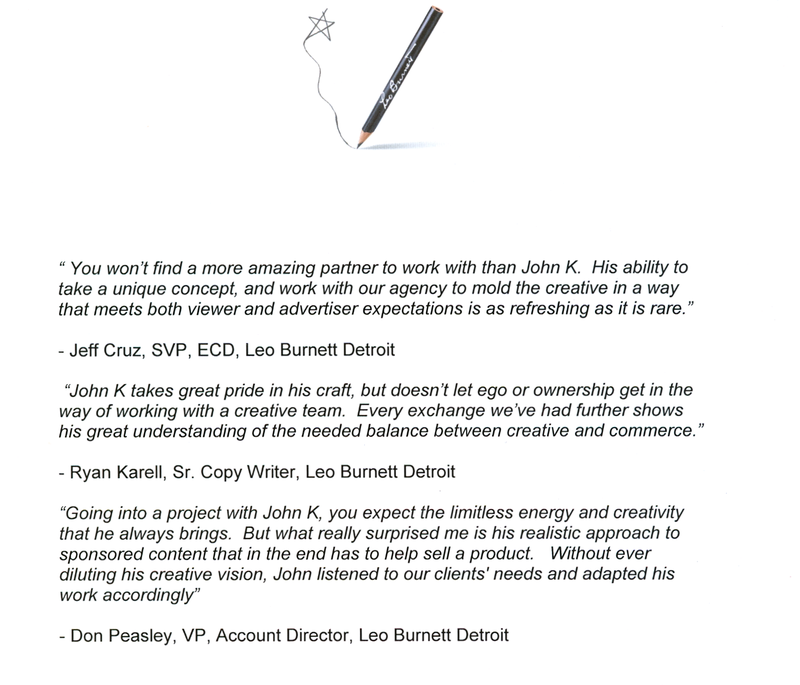 John has created characters for popular and award winning commercials for Old Navy, Nike, NBC and many other major brands, both for TV and Internet. Popular Musicians have asked John to make animated videos for their songs. Bjork, Weird Al and Tenacious D have made popular videos with John. John produced some high quality toys of his own characters and The Three Stooges. He has also made t shirts, comic books and other merchandise using his characters.